Twenty-five years ago I was a student at the Université de Montreal. It was December 6, 1989, and it was a cold, frigid Montreal day. At about 4 o'clock in the afternoon, I finished my last class before the mid-year exams. Normally I'd go to the library, study and head over to the main cafeteria, the one in the Polytechnique, for a bite to eat. But I didn't go to the library, and I didn't go to the cafeteria. I decided to go straight home. I had a big assignment to submit the next day and was determined to get it done. The next morning, the news of the murders shattered my orderly world. Twenty-five years ago I was a student at the Université de Montreal. It was December 6, 1989, and it was a cold, frigid Montreal day. At about 4 o'clock in the afternoon, I finished my last class before the mid-year exams. Normally I'd go to the library, study and head over to the main cafeteria, the one in the Polytechnique, for a bite to eat. But I didn't go to the library, and I didn't go to the cafeteria. I decided to go straight home. I had a big assignment to submit the next day and was determined to get it done. When I arrived at my apartment on the Plateau I took the phone off the hook and cut myself off from the world. The news of the murders shattered my orderly world the next morning. It was the call from my parents that brought me to a new and crude reality. They were frantic from worrying all night, wanting to know if I was all right. The initial news reports were vague and simply told of the death of 14 women at the Université de Montréal. December 6 is my father's birthday and when I hadn't called, to wish him well, they only imagined the worst. As the morning flowed into the afternoon, the pain slowly changed to anger. I started to try to understand. Was this an isolated act of a lone, crazed man or was it linked to a broader societal problem? Sitting in a large room with a grief councillor I remember saying with conviction: "The gunman learned to hate women. It isn't an isolated event." I didn't understand why some of the males didn't see what seemed to me a perfectly obvious truth. I was angry when I heard the blame placed solely on the killer. I felt that his crime touched all women and that we as a society have to be collectively held accountable. My emotions ran amuck that day -- from tears to anger to despair and then back to the tears. Three days after the massacre the student body organized a vigil. I remember holding a candle with a Styrofoam cup to protect the flame from the winter wind. I walked along with what seemed like thousands of students, male and female. I remember the quiet meditative tone of that dark night and the anger, the confusion, the hopelessness that I felt inside me and that I still feel today. Every time I go back to that moment my thoughts swirl into a frenzy and I start seeing a society divided -- men with the power and women with nothing. Why shouldn't I blame male chauvinism as being at the heart of hideous crime? Can I really just chalk it up to mental illness? I have personally experienced enough affronts from men to give me a hundred explanations of killer's insecurities with women. I have since preferred not to think about that day. It stirs up feelings that polarize and that to me is not a good thing. I now teach in an all-boys school. I feel comforted that there is always an assembly organized to commemorate this event. But it doesn't make talking about violence against women any easier, especially when your audience is boys. There is no easy solution that can be provided to a problem that is even more difficult to define. I have organized two assemblies for the Montreal Massacre, but I don't do it any more. I find it to be too difficult. Not because they get me angry, but rather because I get overwhelmed by the injustice of the crime. 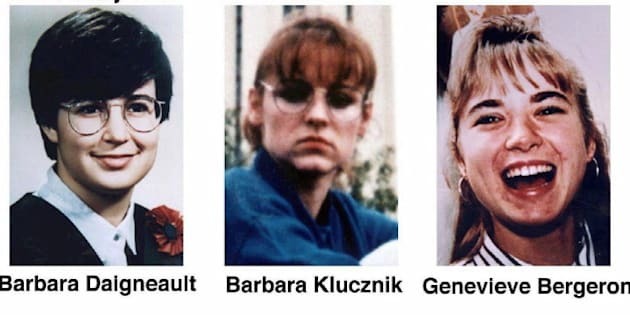 These women died for the sole reason that they were women. During one of the assemblies, my student, the one who always jokes around in class and doesn't seem to take anything seriously, volunteered to do a speech during one of the assemblies. I was taken aback by the beautiful way that he paid tribute to the 14 women who died on that cold Montreal evening. What unexpected maturity and insight. I sat in the audience and cried. It is incredibly reassuring when a man reaches out and tries to understand the violence that can happen against women. That takes strength. Canadian society still has a long way to go in tackling issues of violence against women. I think about the Highway of Tears, Robert Pickton, or Tina Fontaine and my heart sinks. Our school had a yoga session in honour of the White Ribbon Campaign. During their meditations, our boys were encouraged to think about the women that were special in their lives. I was touched when the leader finished the session by instructing the boys: take the white ribbon that you have tied around your arms and now tie it around your heart." What a beautiful way to teach respect between men and women.